Kürzlich ist mit "Science Fiction, Italian Style" in Großbritannien ein neues Buch von Matt Blake erschienen. Bestellen kann man das gute Stück hier: KLICK! Ferner kann man auch seine schon etwas länger erhältlichen Bücher über Giorgio Ardisson: "The Italian James Bond" und sein "In the Name of the Law" über das Italo-Crime Genre sehr empfehlen. "Italy is not a country generally known for its science fiction cinema. Over the years, however, a number of films belonging to the genre have been made and – while there might not be a single, defining science fiction ‘movement’ as such – they make for a curious, compellingly disparate whole. From critically acclaimed futuristic satires to cheapjack exploitation films featuring deadly extra-terrestrials; from counterculture polemics set in an imminent dystopia to post-apocalyptic action movies populated by Mohican-sporting thugs. There might be many different types of films, but they all deal with shared themes and concerns. And that’s not even mentioning the giant chickens and flesh-eating fish. This is the first English language book to deal comprehensively with the subject. Covering all Italian science fiction films made between 1958 and 2000 in detail – as well as including an overview of productions made in subsequent years – it examines a range of interconnected sub-genres, looking into how recurrent narratives came about, evolved and eventually faded. 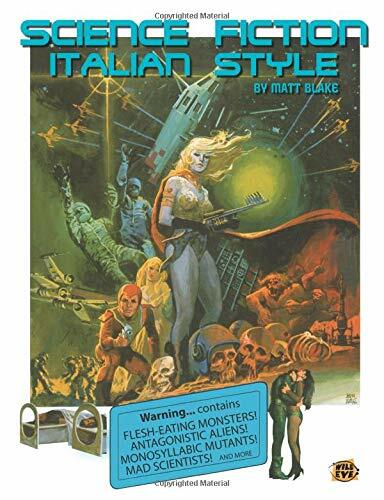 So zip up your space suit, settle back in your anti-gravity seating device… and welcome to the wild, wild world of Science Fiction, Italian Style. The contents themselves cover all kinds of science fiction films made in Italy, including (deep breath): Peplum / science fiction crossovers, comedies, space films (like the Antonio Margheriti Gamma One series), alien invasions, mad scientists, creature features, body horror, spy films with a fantasy element, fumetti adaptations, dystopian future films, Mad max rip-offs, robots and cyborgs… and much much more. There’s also a section which looks at a science fiction films made since 2000."